It’s a good question, but the answer isn’t that simple. The jury is still out on some artificial sweeteners. And your reason for using artificial sweeteners as well as any health conditions you have may determine the answer to this question as well. Some healthcare experts say they shouldn’t be used by anyone long term. 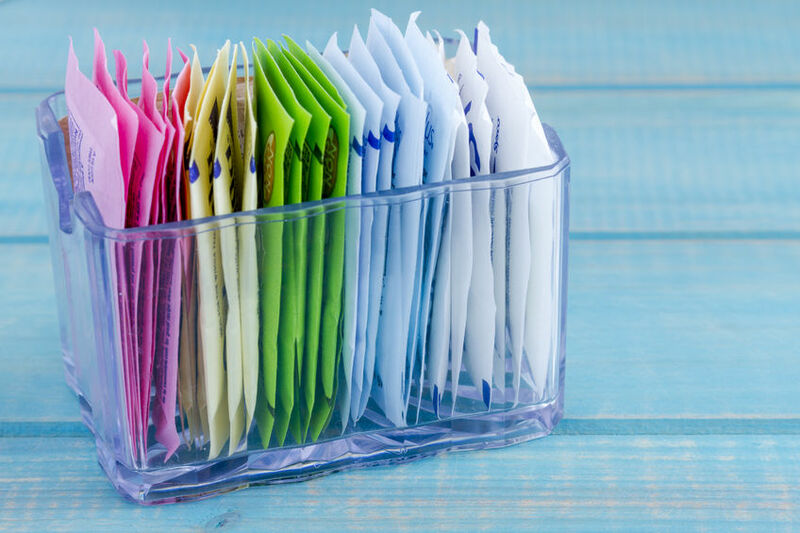 To help you decide what’s right for you, we’ve put together a short primer on artificial sweeteners including available research that might help you decide for yourself. The FDA has approved five artificial sweeteners: acesulfame, aspartame, neotame, saccharin, and sucralose. Acesulfame – While acesulfame was approved by the FDA in 1988, most people may not be aware that it is being used in food and beverages as a flavor enhancer and sweetener. There has been a great deal of opposition to the use of acesulfame K because of limited testing and long-term studies. Acesulfame K contains the carcinogen methylene chloride. Long-term exposure to methylene chloride can cause headaches, depression, nausea, mental confusion, liver effects, kidney effects, visual disturbances, and cancer in humans. Aspartame cannot be taken by those with phenyketonuria (PKU), a rare condition in which the ability to properly break down phenylalanine is impaired. Neotame – Chemically related to aspartame, without the phenylalanine dangers, neotame was approved by the FDA in 2002 and is 7,000 to 13,000 times sweeter than table sugar. It is marketed to food manufacturers as a flavor enhancer. The sweetener lacks independent studies and the long-term health implications are unknown. Saccharin – The oldest of all artificial sweeteners (over 100 years), saccharin went from being banned in the 1970s to being considered one of the “safest” of all artificial sweeteners by some. Recent human studies have found some evidence that it may contribute to bladder cancer. Another possible danger is that saccharin belongs to a class of compounds known as sulfonamides, which can cause allergic reactions in individuals who cannot tolerate sulfa drugs. Reactions can include headaches, breathing difficulties, skin eruptions, and diarrhea. Sucralose – Marketed as a zero calorie sweetener “made from sugar” sucralose (Splenda) sounds natural, but is actually far from it. Sucralose is made when sugar is treated with trityl chloride, acetic anhydride, hydrogen chlorine, thionyl chloride, and methanol in the presence of dimethylformamide, 4-methylmorpholine, toluene, methyl isobutyl ketone, acetic acid, benzyltriethlyammonium chloride, and sodium methoxide, making it unlike anything found in nature. The presence of chlorine is thought to be the most dangerous component of sucralose. Chlorine is considered a carcinogen and has been used in poisonous gas, disinfectants, pesticides, and plastics. The digestion and absorption of sucralose is not clear due to a lack of long-term studies on humans. The majority of studies were done on animals for short lengths of time. And while those studies were mixed, one study found that rats given sucralose at doses of 1.1-11 mg/kg had half of the good bacteria in the gut after 12 weeks. They also found that Splenda interferes with the absorption of prescription medications. Anecdotal evidence in humans consists of gastrointestinal problems (bloating, gas, diarrhea, nausea), skin irritations (rash, hives, redness, itching, swelling), wheezing, cough, runny nose, chest pains, palpitations, anxiety, anger, moods swings, depression, and itchy eyes. Another concern is calories. While there may be less than a single calorie in each packet of Splenda, when consumed in larger quantities—as in foods and beverages, calories can add up. One cup of Splenda contains 96 calories and 32 grams of carbohydrates. Because Splenda is found in so many products, and can be used in cooking, it can add up to 100 calories a day–when you thought you were consuming zero. Many people use artificial sweeteners because they want to lose weight. And some short-term studies suggest that artificial sweeteners may have that effect. But other research raises a concern that they may do just the opposite and actually promote weight gain. One study identified sweetness receptors in fat tissue which raises the possibility that artificial sweeteners could cause weight gain by directly stimulating the development of new fat cells. Other healthcare experts believe that artificial sweeteners, because they are hundreds or thousands of times sweeter than sugar are putting America’s sweet tooth on steroids. They fear that people who regularly consume artificial sweeteners may wind up desensitized to sweetness. Then healthy foods that are less sweet—such as fruits and vegetables—may become unappetizing by comparison. The result— an overall decline of our diet. What if you are pregnant or you want to give your children an alternative to all those sugar-filled drinks and snacks? None of the manufacturers say that women who are pregnant or children can’t consume them, but none of them have long-term studies that prove it is safe to do so. But, there have been studies in rats that show that when lifetime exposure to artificial sweeteners begins in the womb, its carcinogenic effects are increased. The Danish National Birth Cohort, a 6-year study of 59,334 women, found that daily intake of artificially sweetened soft drinks may increase preterm delivery. Therefore, some health experts say it’s best for pregnant women and children to avoid artificial sweeteners. If they are used, they should be used in moderation.